Covered Put - What Does It Mean? 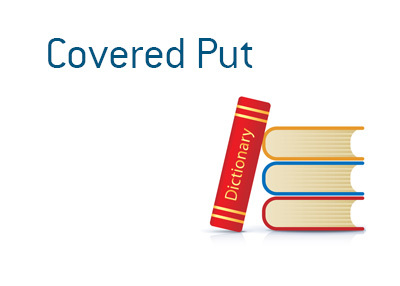 What is a "covered put"? What is the definition of the term "covered put"? A covered put is a bearish to neutral strategy in which you are simultaneously shorting a stock and selling a put. Let's look at an example to illustrate why you might want to implement a covered put. A biotech company has had multiple issues over the past six months and you believe that investors will keep selling their shares in the stock. There is high implied volality in the options and you would like to take advantage of this situation. With the shares currently trading at $45, you decide to take a short position. In addition, you sell a put with a strike price of $40 that is currently three weeks away from expiration. For this put, you get a premium of $1.50/share. So, immediately you have increased your breakeven on the short to $46.50, as you can count $1.50 of premium towards your position. The downside is that you are limiting your gain on the position. Let's say that this stock trades down to $43 over the course of the three weeks and the option expires worthless. Given this scenario, you have made $3.50 per share ($2 per share on the short plus $1.50 in option premium). Let's say that the stock doesn't trade to $43 - instead, let's say that the stock gaps down to $15 one day after a particularly bad piece of news hits the market. In this scenario, you have limited your profit, as your sold put will be exercised and you will be forced to buy back your position. So, if you sold 100 shares of this stock and sold 1 put at $40, your position would be bought back at $40 and you would be flat. A covered put is a great way to generate income if you believe that a stock is going to fall moderately or trade sideways over the near-term. If you believe that the stock is going to take a big fall, you will likely want to avoid the covered put scenario.